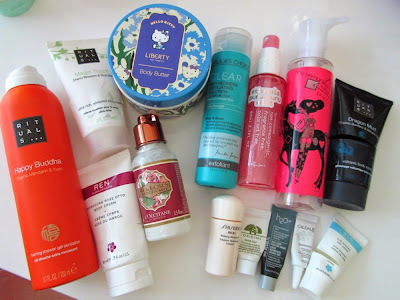 Here's a quick rundown of the products that I used up in April and May. If I had to use only one bodycare brand for the rest of my life, it would probably be Rituals, a Dutch brand that offers a delightful range of scents and is pretty easy on the pocket. It's available on FeelUnique and Barneys. 1. Rituals Happy Buddha Organic Mandarin & Yuzu Foaming Shower Gel Sensation: Rituals' shower gels provide the most bubblelicious experience, foaming up almost straight out of the can. The refreshing mandarin and yuzu scent was an instant favourite. 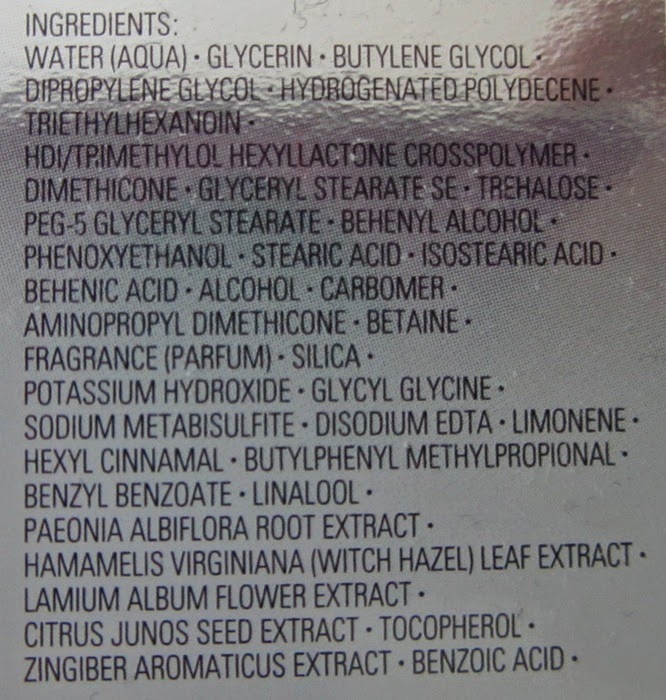 Ingredients list below. 2. Rituals Magic Touch Cherry Blossom & Rice Milk had a lovely comforting scent and hydrated my dry skin well without feeling greasy. 3. Rituals Dragon Mud Organic Bamboo and Volcanic Clay gave good exfoliating action and had a lovely minty scent. 4. Ren Moroccan Rose Otto Body Cream didn't leave much of an impression. This was a gift with a magazine, not something that I would purchase. 5. 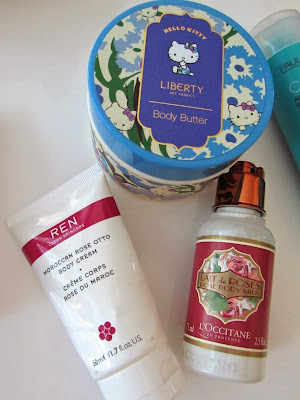 Liberty Helly Kitty Body Butter: This was from Liberty's holiday collection some time ago. This takes some serious massaging for it to absorb fully but it does hydrate quite well. 6. L'Occitane Rose Body Milk is a light textured lotion that absorbs well and hydrates nicely but the rose scent wasn't that special. 7. Shu Uemura Cleansing Oil works very effectively at melting all makeup off and doesn't leave any residue on the skin. 8. 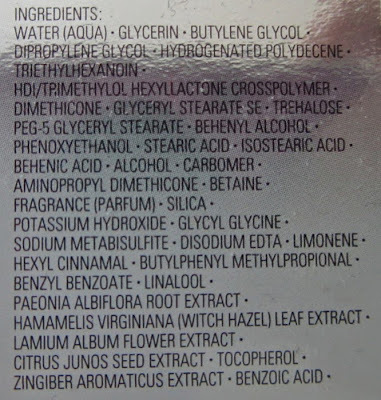 Paula's Choice Clear Anti-Redness Exfoliating Solution with 2% salicylic acid didn't do much for my skin. I also hated how long it takes to absorb and the tacky feeling it left on my skin. I think it also dried out my skin and had me reaching for Avene Cold Cream which I use only as an emergency treatment. 9. Ettusais Puru Puru Mist: I use this in place of a toner in the mornings. I spritz five or six times and then follow up with a moisturiser to seal in the moisture. It freshens up the skin nicely and is fragrance and colorant free. Ettusais is releasing another version in a green bottle (Puru Puru Mist F) with rosemary extract this summer on 19 June in Japan. 10. Shiseido Ibuki Refining Moisturizer was a surprise hit for me. Shiseido's moisturisers are usually too heavy for my skin but since having a baby, my skin has become more dehydrated and this works wonders for drenching the skin and priming it for foundation. I would purchase this. Ingredients list below. 11. Origins Drink Up 10 Minute Mask left my skin feeling plumped up and more even but the effect was just temporary. I vastly prefer Fresh Rose Face Mask to this. 12. 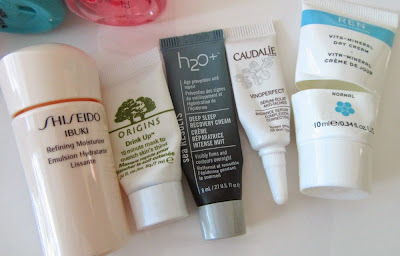 H2O+ Deep Sleep Recovery Cream felt a bit thick and did not absorb as nicely as the Ibuki Refining Moisturiser. 13. Caudalie Vinoperfect Radiance Serum was quite watery and lighter than the typical serum. It provides decent hydration but otherwise, it was nothing special. Ingredients below. 14. Ren Vita-Mineral Day Cream was another magazine freebie. It worked alright on my skin but didn't impress like Ibuki Refining Moisturizer did. 15. 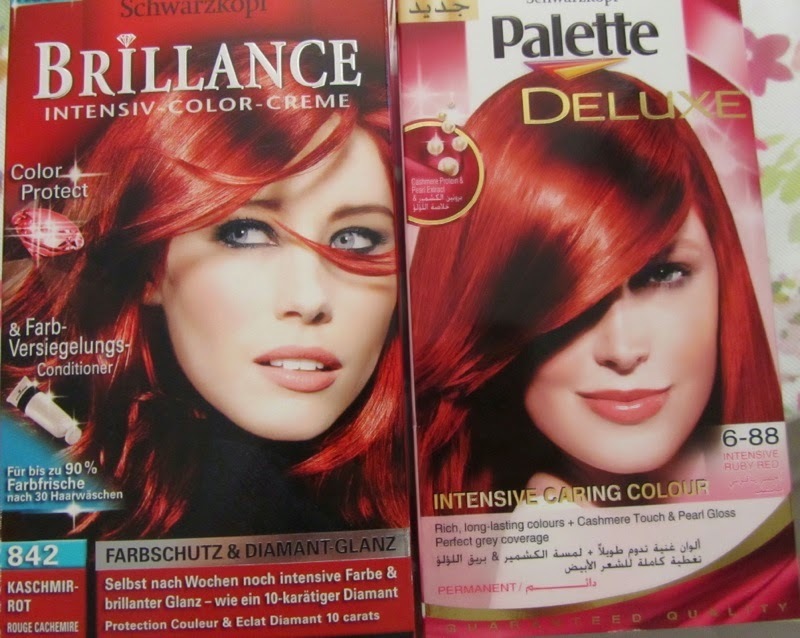 Schwarzkopf Brillance Intensiv Color Creme 842 Rouge Cachemire and Palette Deluxe 6-88 Intensive Ruby Red: This is my favourite brand for hair color. This combination turned out as a deep rich red that really brightens up in the sun. All my white hairs were completely covered. It does stain towels for a week so I have to be careful when my hair is still damp. Both hair dyes are by Schwarzkopf, just different ranges and shades that are very similar. Wow! Great job on using it up! The mandarin and yuzu shower gel sounds divine!